I have picked up quite a few new drug store foundations lately and they are bringing out lots of new ones that definitely rival more expensive ones. I did used to struggle finding affordable foundations that covered everything I wanted but in today’s post there are some absolute gems that have wowed me and will be definite repurchases. I will start off on one that hasn’t wowed me as such but is still a good and affordable product. This is a medium coverage with a demi matte finish so it isn’t a dewy finish but also doesn’t make my skin look flat. I tend to use this for everyday use for work as it doesn’t make my skin look flawless but it stays on all day and doesn’t go patchy. This is a new one out and I was really drawn to the fact that it is supposed to perfectly match you skin tone and blend in as if it isn’t there. Saying that it does mean it’s more of a natural, lighter coverage that conceals imperfections but doesn’t necessarily cover everything. In this one I went for a light shade that I would normally as I though it would be good for winter and work days when I only need a natural complexion. I also find this to be quite a dewy finish so it needs setting into place with a powder but it does seem to hydrate my skin. This has been the biggest wow for me from the drugstore and I’m honestly so impressed with it that it is one I would consider paying more for. It’s a full coverage finish that stays in place all day and still looks as good from the start to finish. Although the coverage is full the weight of the foundation itself is nothing so my skin doesn’t feel clogged up. All in all this is probably a favourite for me in this post and I’ll be picking this up over and over again. I picked this up on a whim as I had heard it is the best thing to wear as a base layer under a cream contour, but the coverage is a lot more that I expected and I wear it as a stand-alone foundation. I’m unsure why but it only comes in two shades light-medium and medium-dark, I have the latter and it is not at all dark so unfortunately those with darker complexions it would not be suitable unless they brought out more shades. In terms of the formula is a creamy and blendable that evens out my skin tone and hides imperfections but still covers everything I need/want it to. I do wish L’Oreal would hurry up and bring this out the in the UK as it’s such a lovely foundation and formula and one of my favourites to use during the summer months. It had a medium coverage that gives a lovely dewy glow but it doesn’t look shiny or greasy. The longevity of this is okay and it does look good after a day at work but it isn’t one I would use if I wanted to wear this day to night. This is another of my favourite foundations but I do think it is quite overpriced for being drugstore. However, I actually really like this and would repurchase. This is quite a watery formula but it gives a good amount of coverage and can be built up depending on the look you would like. This has a dropper style applicator so you also don’t end up wasting too much product. This is unfortunately one that hasn’t amazed me unfortunately and I have found it way too heavy to wear. This is quite a thick formula and I would say its more like a mousse than a cream so it just feels cakey on my skin and doesn’t blend in seamlessly. I do keep trying with this but unfortunately I don’t think it’s a winner for me and I won’t be buying again. This is one of those that cushion foundations that really intrigued me and for the first few weeks I have really liked this. It gave quite a natural finish and evened out my skintone to give a glowing complexion. However, I hadn’t used this for about a month and went to use again and unfortunately it has dried up and is basically unusable. This is another new one out and part of the new Revlon range that promises to smooth out lines and wrinkles to reveal smooth and plump skin, and also minimise the look of age spots and hyper pigmentation. This is a light weight formula that gives a natural coverage allowing the skin to breath. The formula of this is also ultra hydrating so it doesn't dry out skin or settle into dry patches. 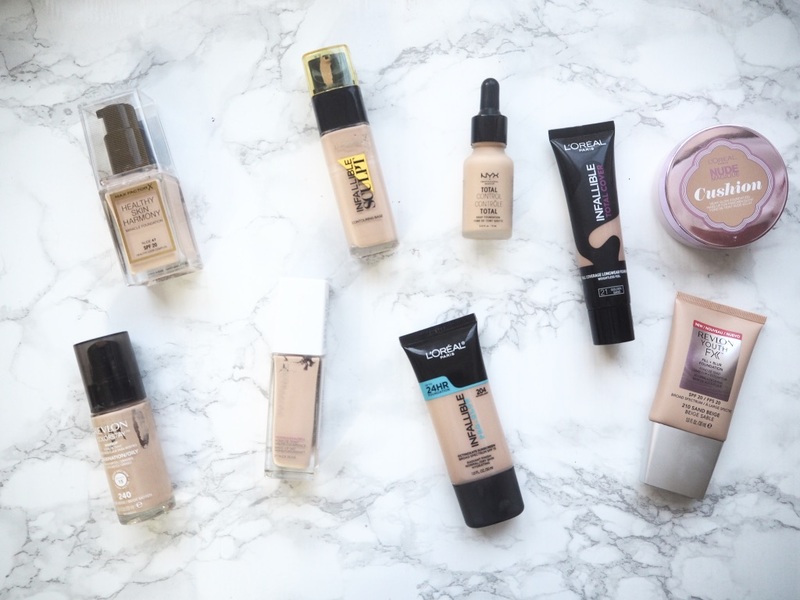 Do you like any of these drug store foundations? I looove the Pro Glow foundation! Definitely one of my favourite drugstore options! I totally agree with the loreal total cover, its almost impossible to work with and I can only see it working on oily skin types because its so thick and dry. I really want to try the nyx foundation, heard so many good things!